These two photographs shows the state of Castle Park after repeated weekend events, in July, and College Green earlier in the year: [gallery link="file" columns="2"] The grass had scarely begun to recover from events on previous weekends before the vans and lorries were rolling over Castle Park again. As the Council's open spaces department has come under more pressure to make money, green spaces like Castle Park and College Green are coming under increasing pressure. 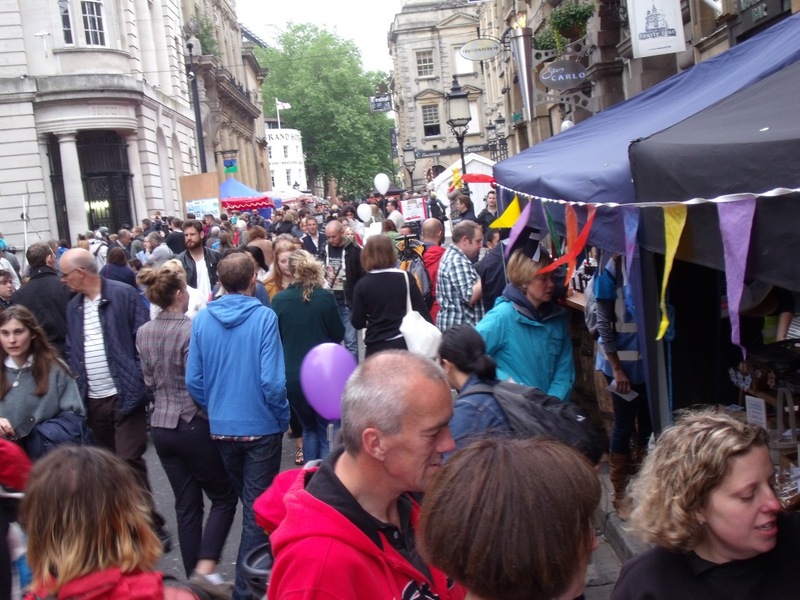 The Living Heart for Bristol has called for more hard-standing space to be provided for events in the central areas, and to 'let parks be parks' to preserve the few green spaces for quieter time out in the city centre. Update June 2013: Following negotiations with the Courts service, the Council has been unable to go ahead with the full trial while the redevelopment of the Old Magistrates Court is underway. This is expected to take around 2 years. 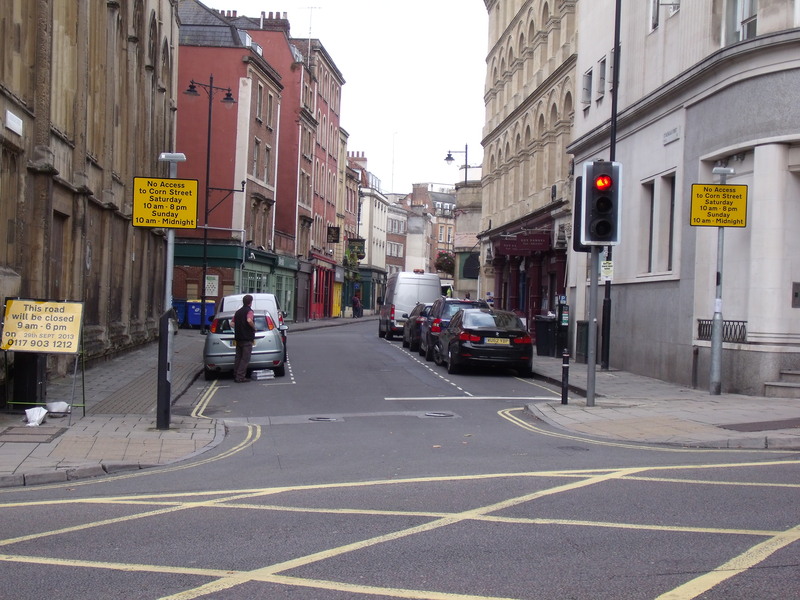 In the meantime, Corn Street will be pedestrianised at weekends, parking will be removed, and the right turn from St. Nicholas Street into Corn Street will be banned. This is a small step forward, but some way short of what we would like to see. See the details: Update from the Council June 2013 Update May 2013: an unfortunate problem has occurred. The proposed demolition of the Old Magistrates Court is threatening to delay the plans. Negotiations are continuing. Read the Living Heart's report into the problem. 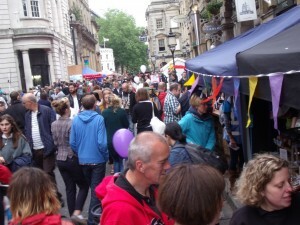 Update February 2013: Following the public responses to the consultation, the Council has now proposed a trial, which largely follows the Living Heart for Bristol's alternative proposals (see below). Read the story in The Post. "You have my wholehearted support for this declaration which I have just re-read and find myself in full agreement with. It fully fits my approach to environment, economy, health and transport and I am intimately aware of all the cities that you mention, including Groningen & Copenhagen both of which I have studied and made films of for the BBC. I would like to think as an independent with a can do attitude I am in a stronger position to work with Living Heart than any party candidate. This scores very high on my agenda and you have my permission to add my name as a supporter on your website." 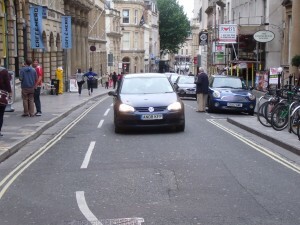 The Living Heart for Bristol* has called on the City Council, and candidates for the mayoral elections to explain how they will improve air quality in the city, following the European Commission’s recent threat to prosecute the UK Government over air pollution in 12 cities including Bristol. The Commission recently rejected a request by the UK Government for an extension to the 2010 deadline for complying with European limits on air pollution. Under the Localism Act, local authorities can now be made to pay fines imposed by the European Courts. In a separate decision, on Bristol’s bid for European Green Capital bid, the Commission commended Bristol’s “comprehensive air quality monitoring network”. This monitoring shows that air pollution in central areas, and along motorways and major roads, frequently exceeds European safe limits. The European limits were set following international evidence that air pollution causes: heart disease, lung disease and early deaths. The main problem highlighted by the European Commission is nitrogen dioxide from vehicle emissions. Spokesman for the Living Heart for Bristol, Steve Melia said: “It’s ironic that the European Commission is praising Bristol for its air quality monitoring at the same time as threatening to prosecute the UK Government over air pollution here. And the victims – the people of Bristol – could be fined, through the council tax, because these levels of pollution are threatening our own health! The challenge for councillors and mayoral candidates is to say: what will you do to protect the health of our citizens living in central areas, and near the main roads? Our proposals to remove through traffic from the central areas will also reduce traffic on the main roads leading to and from the city centre, and encourage walking and cycling. These must all be part of any solution to the scandal of dangerous air pollution here in Bristol.” * The Living Heart for Bristol aims to improve the central areas of Bristol and create new public space by removing through traffic, whilst retaining access for all. It was created by the following 8 organisations: Bristol Cycling Campaign, Bristol Green Capital, Bristol Living Streets, Carfree Bristol, Friends of the Earth, the Open Spaces Society, Bristol Ramblers Group and Streets Alive. Several other organisations have endorsed its declaration – shown on www.livingheart.org.uk. The plans to remodel the city centre are a major step backwards from the original plans floated in 2009. They will drive a new road through the pedestrianised area by the fountains. The plans for the Northern part of the route will create a new fast road link from Bradley Stoke to the M32, sucking more traffic towards central Bristol and undermining the whole purpose of a bus rapid transit. Comments on Zone 5 (city centre): The plans to remodel the city centre, as suggested, would be a lost opportunity. They would spend a lot of public money to achieve very little improvement in the pedestrian experience. The new direct road from Baldwin Street to the Hippodrome would make that part even worse than it is at present. I/we support the proposals of the Living Heart for Bristol and believe the Council’s objective should be to remove through traffic from the city centre. I/we believe the Council should return to the original proposals made by Cllr. Rogers in 2009 on: http://askbristoldebates.com/2009/12/31/city-centre-re-modelling/ Comments on Zone 2 (Stoke Gifford transport link): As proposed, these plans would open up a new, fast, route for general traffic to drive from Bradley Stoke to central Bristol along the M32. The new route created for cars would be faster than the rather convoluted one planned for the BRT. This would undermine one of the main stated objectives of this scheme and the Joint Local Transport Plan to reduce carbon emissions and congestion. Any local congestion benefits (around Parkway Station, for example) would be displaced onto the ringroad, the M32 and central Bristol The solution to this problem is very simple: a bus gate on the new road between Bradley Stoke and Hambrook Lane. This would return the scheme to what it was intended to be: a plan to promote and encourage public transport, by giving a significant time advantage to the bus. This would help to reduce the costs of the scheme, as making that section for buses only would allow it to be narrowed.